Want a “best ever” Christmas Cooking party? Good tidings – you’ve found it! Take corporate cookery classes to a whole new level with our Ultimate Christmas Party or Team Building Christmas Party and spread joy in your team. Do you just want to have fun (without the team building)? Try our Ultimate Christmas Party – 3 hours of hands-on cooking, feasting and festive frolics priced to fit in a stocking. “Create your own restaurant” with your team, becoming in turn star chefs, service staff and customers in a Christmas party with fantastic food, festive music, creative energy and a focus on fun. Deck the halls, rock around the Christmas tree and have a ball! (And it’s priced to fit in a stocking!) Complete packages are available from $150 +GST per person for 31-40 guests (excl. beverage). VictorsFood hands-on cooking events are the best way to spread joy in your team. 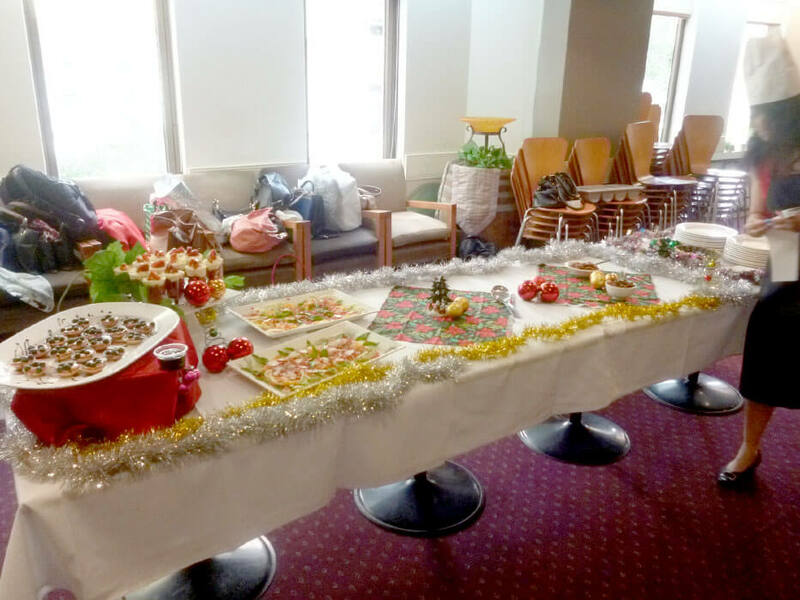 Take an exciting cooking team building format or cooking party and wrap it in Christmas cheer. We even bring great music and the festive decorations! Just add your team and “yule” have the Christmas party (with or without the “Christmas”) everyone will remember and talk about forever. Group cooking is a fantastic way to engage your team and get their creative juices flowing, plus you get to eat the rewards. Add a bit of great music, tinsel or sparkling wine (or water) and you’ve got the Christmas party your guests will be thanking you for in years to come. We’ll make you the “star” this Christmas! Your objectives are Guaranteed. We’re Australia’s Best Team Builders! You get a great party, brilliant fun and the benefits of team building. VictorsFood cooking events are fully interactive and engaging for everyone, every aspect is carefully designed for groups. Let VictorsFood be your Santa’s helper. We make it easy for you to organise from the venue to the menu. We can deck the halls as much or as little as you like and create a menu to make all your guests merry, whatever their culture or religion. We host team cooking Christmas parties for corporates, businesses, community groups, sporting groups, friends, social clubs, teams of any kind. We are totally portable and cook with groups all over Australia in all kinds of venues. 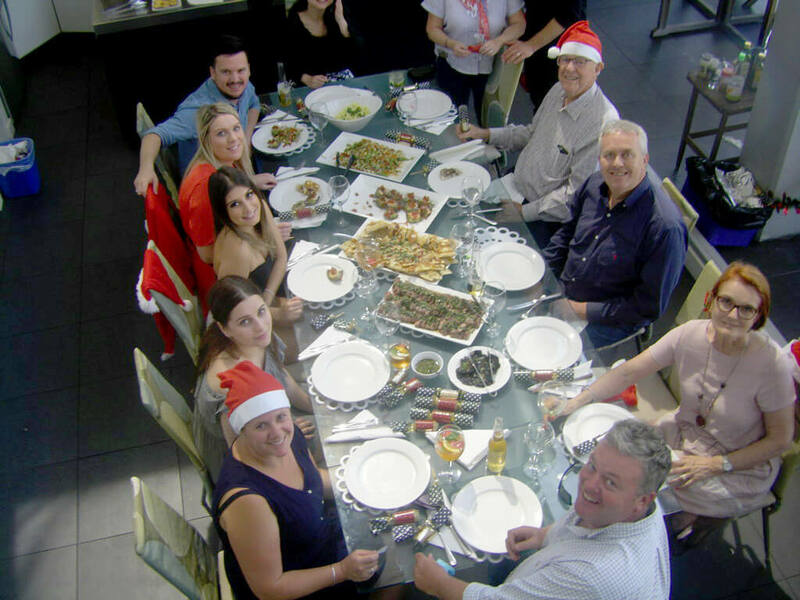 Whether your group is 8 or 800 people; if you’ve got a venue, or need us to organise one, we can create your “best ever” Christmas party anywhere in Australia, from Sydney, Melbourne, Brisbane, Gold Coast, Canberra, Hobart, Newcastle, Wollongong, Perth, and Adelaide to Darwin! We’ll make you the “star” this Christmas! * Value varies with the number of guests. Estimates based on a group of 25. Conditions apply.